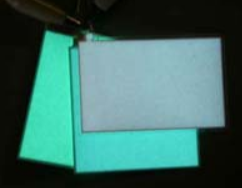 LED (light emitting diode) backlights are the most popular type of backlight for small and medium LCDs. A new trend has begun where even large displays such as laptops, desktop monitors, and LCD TVs have LED backlights. The advantages of LEDs are its low cost, long life, no EMI interference, low operational voltage, and ease of brightness control. One disadvantage in larger displays is that too many LEDs increase the power consumption and will generate heat as a result. However, this problem will soon be overcome. LED backlights come in several different colors: yellow-green, orange, amber, pure green, blue, and white. There are two basic LED backlight designs: Bottom (array) and edge lit. The bottom (array) lit configuration has several LEDs mounted uniformly behind the display, which provides uniformity and brighter lighting, but also consumes more power and requires thicker LED backlights. The edge-lit configuration consists of LEDs mounted to one side or corner, which offers a thinner package and consumes less power. The edge-lit design occupies 98% of the LED backlight market for small to medium LCD modules. Electroluminescence Backlight, or EL Backlight, is a solid-state phenomenon which uses colored phosphors, not heat, to generate light. EL backlights are very thin, lightweight and provide an even light. They are available in a variety of colors, with white being the most popular for use with LCDs. While their power consumption is fairly low, they require voltages of 100 VAC @ 400Hz. This is supplied by an inverter that converts a 5, 12 or 24 VDC input to the AC output. EL backlights also have a limited life of 3,000 to 5,000 hours to half brightness. The biggest drawbacks to an EL panel is that it requires an inverter to generate the 100VAC, consistent brightness, and limited life. Cold Cathode Fluorescent Lamp, or CCFL, backlights offer low power consumption and a very bright white light. 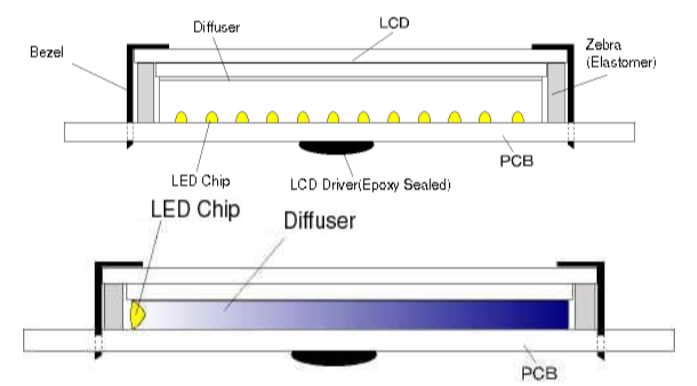 The primary CCFL configuration used in LCD backlighting is edge lighting. A cold cathode fluorescent lamp is the light source with a diffuser distributing the light evenly across the viewing area. CCFLs require an inverter to supply the 270 to 300 VAC @ 35KHz used by the CCFL tube. They are used primarily in graphic LCDs and have a longer life – 10,000 to 20,000 hours – than EL backlights do. Their biggest drawbacks are: cold weather will reduce the light output by as much as 60%, they require an inverter to generate the 350VAC please note that the inverters do not function well at low temperatures, the light intensity cannot be varied (it is either on or off), and vibration can reduce the life expectancy of up to 50%.